Whether the horse tries to run out at the fence or simple stops directly in front of it, the issue is the animal’s lack of obedience in going forward from the rider’s leg. For this reason, once you have the horse standing squarely in front of the fence, punish its source of forward momentum, which is the rear part of its body, with your stick in the area just behind your calf–on the horse’s ribcage. If the horse stopped straight, you can punish it on either side; but if it veered when stopping, apply the stick on the side to which the animal tried to escape. When a horse has a refusal or runout at a fence, correct the disobedience by making the horse face the obstacle, then applying the stick on its barrel. The stick should never be applied anywhere in front of the saddle. By being prompt with your correction, you won’t have to exert a tremendous amount of physical force. You are not trying to inflict pain, but rather just enough discomfort so that the horse would rather jump the obstacle on the next approach than be punished again with the stick. Remember, only do what it takes to get what you want from the horse–any more than that is abusive. You should always carry a stick when jumping, so that it can be used immediately. If you have to hunt for one when a problem arises, the horse may have forgotten what it did wrong by the time you apply it, so that the punishment is seemingly unrelated to the initial problem. Always remember to ease off the mouth when the horse leaves the ground to jump, for if your hands are hard and restricting, you will encourage it to refuse fences. Especially when it has stopped and you are approaching the obstacle for the second time, emphasize your driving aids–legs and seat, too, if necessary–and relax your hands as much as possible, keeping just enough tension on the reins to steer the horse. Your objective is to make going forward much easier than stopping. You may not be able to keep a very light hand on a horse that wants to run out. In fact, you may have to use a great deal of hand pressure to hold it into the fence panel as it tries to veer in one direction. If this the case, be sure to release the horse’s mouth as it leaves the ground, offering more than enough slack in the reins over the fence so that it will realize that forward is the most comfortable direction. If you ride the horse accurately to take-off spots, but it tries to refuse fences, ask a veterinarian to check for unsoundness. Lameness in a leg or foot, sore back muscles, or a spinal problem are typical unsoundnesses that will cause a horse to stop. The hand gallop is used for jumping fences and is also one of the USEF’s Tests 1-19. It is performed at between fourteen and sixteen miles per hour, or 1232 feet to 1408 feet per minute, and should appear controlled and at a speed appropriate for the size of the arena. At the hand gallop, the horse’s footfalls strike in the same three-beat sequence as at the canter. This distinguishes the hand gallop from the faster racing gallop, which through extension of the horse’s limbs causes the feet to fall in four separate beats. The rider's body is correctly angled about 30 degrees forward during the hand gallop on the long side of the arena. You should be in two-point position for the hand gallop, with only your two legs making contact with the horse, and your usual third point of contact, your seat, being raised above the animal’s back. The lack of weight makes it easier for the horse to carry you at a greater speed and enables it to jump less encumbered. 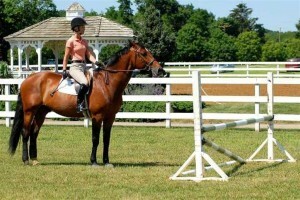 The rider's upper body should be a little less inclined as the horse begins the curve on the short side of the arena. Demonstration rider, Maria Schaub, has correctly opened her upper body slightly to help balance the horse on the curve. Your torso should be inclined forward at the hand gallop, “with the motion” of the horse. The angulation will vary somewhat as the horse’s stride is shortened or lengthened. For example, when the horse is hand-galloping down the long side of the arena, your hip angle should be closed about 30 degrees in front of the vertical to be with the motion. Just before the short side of the arena, you should open the angle to a slightly more erect position, so that your upper-body weight can aid your arms in collecting the horse to balance it for the corner. Your seat, however, should remain out of the saddle the entire time. Longeing is not only useful in teaching the horse rhythm, balance, bending, and obedience, but is also useful in helping the rider improve his position and balance. 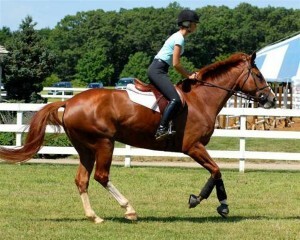 First, tie the reins around a clump of mane and take off your stirrups before you begin. Make sure the horse is equipped with side reins and that the person longeing you has a longe whip and is familiar with how to use it, for the ground person will be controlling the horse while you concentrate on yourself. Try working on the longe line at the walk and trot first, until you feel really comfortable. You can practice relaxing your seat so that it follows the horse’s back at the sitting trot, or can work at the posting trot, holding your hands in the same position as if you had reins, but finding your own balance without having them in your hands. You can concentrate on feeling the center of your horse, so that you won’t be leaning to one side or the other inadvertently. 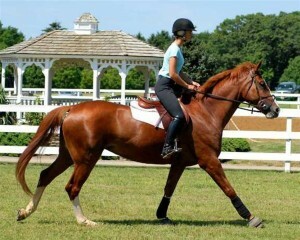 Then you can add a little canter work. The entire session should not last more than 20 minutes, and the horse should be reversed every five minutes to keep your work even on each side. When longeing without stirrups or reins, the rider can grasp the pommel of the saddle with the outside hand and the cantle with the inside hand to adjust the seat forward if it begins to slip backward in the saddle. Flatwork is the adaptation of the schooling movements and principles of dressage to the needs of hunters, equitation horses, and jumpers. While dressage encompasses difficult maneuvers such as the passage and piaffe, in which the horse’s steps have a tremendous amount of suspension, these movements have no reasonable application for horses being shown in the hunter, jumper, or equitation divisions. Consequently, hunter seat riders must choose the dressage exercises which are the most beneficial and disregard those that are not helpful in achieving their goals. Basic elements of flatwork are pace, bending, and transitions. Pace is the speed at which a horse travels in each gait. Bending refers to the horse’s body being positioned on a curve to either the left or right. Transitions are the brief periods of change between one gait and another and are categorized as either upward transitions, which are changes to a faster gait, or downward transitions, which are changes to a slower gait. Advanced concepts of flatwork are impulsion, collection, and lengthening. Impulsion is the degree of thrust, or power, a horse has as it moves. Collection is the increased engagement of the horse’s quarters for the benefit of lightness and mobility in the forehand. Lengthening is the forward swing of the horse’s limbs in free and moderately extended steps, demonstrating impulsion from the hindquarters. Work on the flat can be physically difficult, confusing, and frustrating to learn. This is because good flatwork requires precise coordination of your legs, hands, and weight. Once you are proficient on the flat, however, daily exercises will be enjoyable and fulfilling as your horse progresses. You will then view flatwork as a logical process which enhances the horse’s abilities and miinimizes its weaknesses, allowing your animal to be the best athlete it can be. It is important to note that the flatwork movements required in hunter seat equitation have increased in difficulty in recent years. For example, the USEF Talent Search Class has always asked for the working walk, working trot sitting, working trot rising, working trot with a lengthening of stride, working canter, working canter with a lengthening of stride, and counter canter. You’ll see in a video at http://www.youtube.com/watch?v=3WaEf6BXOW8&feature=related, entitled “USET Finals Flat Phase 2008,” that when judging the USEF Talent Search Finals, the judges also called for a “shoulder in and shoulder out exercise,” a “half pass with a flying change of lead,” and a “haunches in and haunches out exercise.” You can find these movements in the sample chapter of my book on this website by going to http://annamullin.com/lateral-exercises-at-the-walk-and-trot.